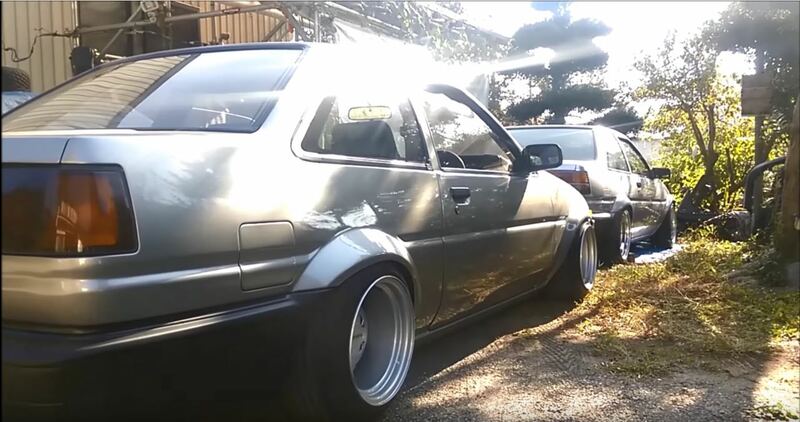 Widened steel rims look spectacular on an AE86, but 10.5J wide original 13 inch pizza cutter rims look even better! AE86Lavender produced a set of widened 13 inch Toyota AE86 OEM rims, that are also better known as (one of) the pizza cutter rim designs. He produced a set of 9.25J up front and a 10.5J for the rear. Apparently he is not going to drive around with these rims in the end, but one of his customers is. I think it is one of the most amazing things you can do to an AE86: fit widened pizza cutter rims in true retro style! Who said 13 inch wheels look bad on the AE86? I would say the whole tire/rims size is a big debate within the AE86 world. On one hand the larger the rim size, the better it looks. The wheels look more flush with the fenders and the tires can be made skinnier with a much slimmer side wall. On the other side smaller rims are better for drifting, cheaper and much more (retro) designs are available. You probably can find them in the local classifieds for only a fiver. That’s why these custom pizza cutter rims are so cool! They maximize the old retro style to the more modern look and feel!